In January 1914 the French Army had 47 divisions (777,000 French and 46,000 colonial troops) in 21 regional corps, with attached cavalry and field-artillery units. By 1918 about 40% of all French troops on the Western Front were artillerymen. Increasing use of machine-guns, armoured cars and tanks also reduced the numbers in the infantry. 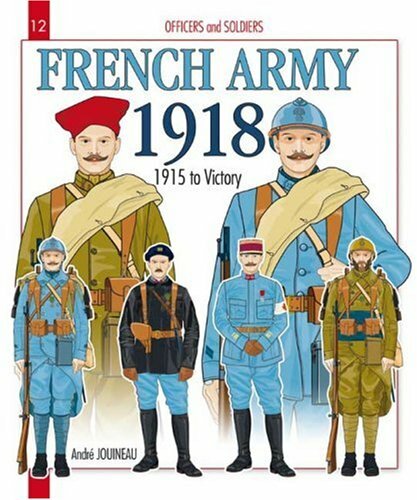 This volume examines the French Army's last year of the Great War. Since the seventies, Andre Jouineau has dedicated himself to studies in history and uniforms. Regular contributor to various magazines, he was appointed official painter of the Army in 1985 (title kept until 1994). Then, in the mid-nineties, he tackled computer illustration, which allowed "creating" a new uniformology genus.